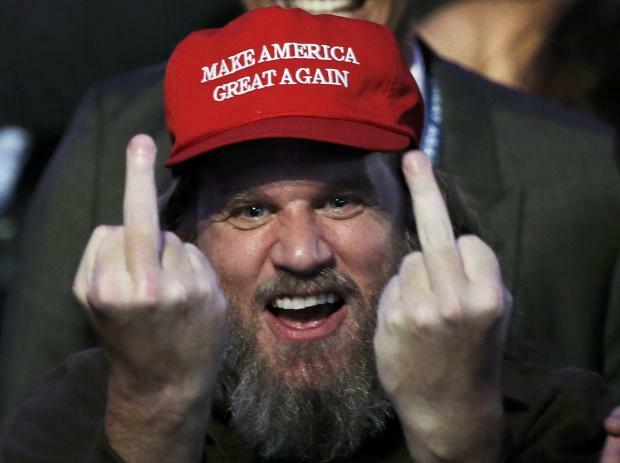 Two fingers up... a Donald Trump supporter. When the news emerged on January 10 that rock legend David Bowie had died, I was among the army of fans who went into overdrive to try to explain the terrible implications to anybody who dared to listen. Of course, the theory that Bowie was more than just a rock god was somewhat exaggerated, yet you have to be an eternal optimist not to realise that the glue of common decency has been spent. 2016 was such an abysmal year it's become almost an adjective. Bowie, Alan Rickman and Prince were among the stars who kicked the bucket well before their sell-by date. But while death is inevitable [yes, that includes the famous and wealthy], in 2016 it seems the whole world imploded. A demagogue has been voted in as US president, the British voted themselves into a political limbo, and the far-right has reared its ugly head in too many countries. Xenophobic populism and hate crimes have stomped all over the western world to the extent that the historical parallels with the 1930s are no longer far-fetched. Terrorism keeps stealing innocent lives – Islamic radicals kill in the name of a religion that does not exist, Americans keep shooting each other in the name of a constitution that gives them the right to bear arms, Maltese men were blown up in cars in the name of a crime that forever remains unresolved. Leaders remain reluctant to act over Syria because they know it will not win them domestic brownie points. Meanwhile, the left-wing protesters who made populists tremble in the past went completely dormant in 2016. We've reached a stage where you almost dread to check the news. And, anyway, many of you might ask, why should we bother when most of the stuff we’re reading on Facebook is false? Social media has accelerated our ability to form closed, like-minded armchair critics – and an inane ability to attack each other in public without apparent consequence. No wonder it's a jungle out there! In 2016 we established ourselves as a selfish, misinformed generation bent on building walls, where we attack the victim rather than the cause. Instead of demanding our so-called establishment leaders to change their ways [or voting them out] we are voting in people who are legitimising bigotry. 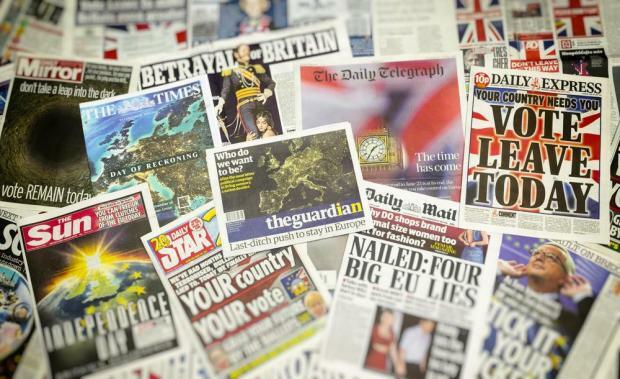 The tabloids are responsible for spreading hate and misinformation. Inevitably, the social and political upheavals are driven to a large extent by economic causes. The world today is far more divided between rich and poor than it was a quarter of a century ago. Imagine, the 10 wealthiest people in the world collectively hold $500 billion, that's more than most countries produce in a year, according to Forbes. Technological advances have accelerated the already widening economic inequality around the world with small groups of people making hefty profits with little human resources. It is inevitable, it is 'progress', but it is also socially destructive. We are not living in isolation. The rich in Malta are getting richer while the poor are struggling to keep up with the cost of living, rising rents… Too many of us turn a blind eye to corruption because, you know, ultimately, many don't mind it if they can somewhat benefit from it. And all this is happening as Malta assumes the EU presidency when a number of the dramatic decisions taken in 2016 will come to fruition. We cannot hold the geopolitical landscape together, but each one of us has the duty to speak up where there is wrong, even if it might not resonate amid the cacophony of hatred and misinformation out there. We need to encourage critical thinking rather than neutered passiveness. Equally important, in 2017 we need to take a good look at ourselves. We see discrimination in others, but not our own, we choose to shut out critics while guarding our chosen tribes. We need to look beyond our bubble and understand the bread and butter issues, jobs, health care, and so on. But I can never subscribe to the theory of normalising the nonsense and hatred coming out of the likes of Trump's mouth and tweets. As we sign off 2016 as the year of hate we need to arm ourselves with information, the power to speak up and demand change if need be. Unless we do so, we can resign ourselves to an even bloodier 2017.